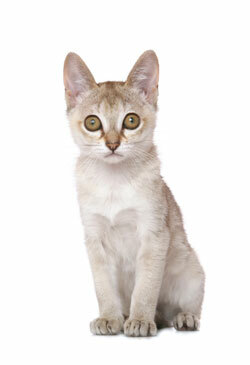 The Singapura is one of the smallest breeds of cats, noted for its large eyes and ears, brown ticked coat and blunt tail. Reportedly established from three "drain cats" imported from Singapore in the 1970s, it was later revealed that the cats were originally sent to Singapore from the US before they were exported back to the US. Investigations by the Cat Fanciers' Association (CFA) concluded no wrongdoing and the Singapura kept its status as a natural breed.